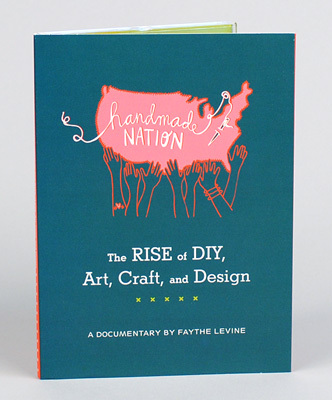 Faythe Levine created a documentary about the “new” trend in America – handmade crafts and art. Trend is probably the appropriate word since it usually refers to what Americans are buying today. But two generations ago Americans, like my grandmother Louisa Burns, who crafted their own food, clothes and entertainment were the norm. Growing up in Saudi Arabia before the Rashid Mall existed, my own mother used to sew clothes for us. Once she sewed me a bathing suit. Granted the moment I entered the sea, I wished she had spent the $20 to buy me a suit from Sears. The material she choose stretched, and my bikini quietly floated off my body with the same leisurely stroke as the jelly fish around me. Although I haven’t seen this film, my guess is this is about Americans who are discovering joy and pride in making their own stuff, instead of buying cheap, mass produced goods imported from China. Calling this trend the RISE of Do-It-Yourself Art, Craft and Design seems a bit grand. However, if you are of Ms. Levine’s mid-30s and under generation, maybe you are unaware that it is possible to knit your own socks, can fruit and mold your own soap. Potentially this film may highlight the fact that many Americans, including young Americans, are out of work because corporations have moved their manufacturing and service jobs outside the USA. If Americans are not highly educated, they are having difficulty finding high-paying jobs that can support them. And like people in developing countries who do not have the cash to buy manufactured goods, these Americans are re-learning the art and craft of handmade items. Whatever the message it is an excuse to enjoy a short film that may inspire you.